A static electricity is a stationary electric charge that is produced by friction and contributes to a minimal electric shock when it attracts dust or hair. Static electricity is produced when a surface has a high resistance to an electric current that gets in contact with another surface and then separates afterward. Each material is made up of atoms that are neutral, containing an equal amount of positive and negative charges. The anomaly of static electricity starts when positive and negative charges separate. If both of these charges separate, its electrons move from one to the other and can make the material more positively charged and the other material becomes more negatively charged. Static electricity has its own advantages and it can be quite useful in many ways. It can be used to operate photocopiers and printers. It also has its disadvantages, one example of the nuisance you get from static electricity is a painful and uncomfortable shock. The charge can often build up on people even during the ordinary things that they do every day. One example is by scuffing your feet on a rug. With this, you are able to pick up electrons and get a negative charge. Once you make contact with metal or any other conductor, the electrons you had while scuffing the rug will instantly transfer to the conductor and cause a shock. Also, static electricity happens often during cold and winter season as the air is dry and electrons can easily build up on a surface. Anti-static sprays are made to treat materials and surfaces to eliminate static electricity, making a material or object slightly conductive. To prevent static from creating a build-up, there has to be an electric circuit that can prevent these charges. Anti-static products do just that and can help you with physical and chemical methods. Getting electric shocks when entering or exiting a car have happened to almost everyone. Some find it annoying to frustrating, especially if it disrupts their routine, even for just a short period. This can be remedied with the use of static strips that are attached to the bottom part of the car, which will carry electricity to the ground. Have you ever thought about how airplanes can withstand being struck by lightning? Planes have static wicks to prevent static build up that can cause spark formation. These wicks are used as conductors to prevent static electricity build-up on the plane’s fuselage, which can be disastrous when ignored. People can form a static electricity with almost everything that they do. To prevent this shock, anti-static sprays are made to spare them from such nuisance. In buying an anti-static spray, know which product you need based on the kind of static electricity you want to eliminate. Do you want to avoid being zapped when cleaning the carpets or do you want to keep clothes from clinging with each other? 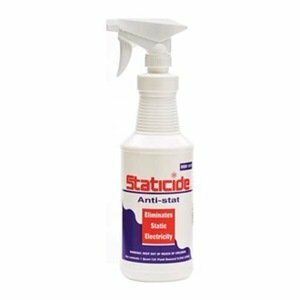 This heavy duty anti-static spray from ACL Staticide eliminates static and prevents tribogeneration on upholstery, fabrics, and carpets. It prevents static problems like the ignition of dust, solvents, or causing fire or explosion. It can also be applied on floors around sensitive electronics, used in your vehicles, and in your office. With this anti-static spray, you won’t have to struggle with static build-up anywhere. For people who have problems with electronic ground and static electricity in offices or at home, ACL’s Staticide 2005 Regular Heavy Duty Topical Anti-Stat is the solution for high friction surfaces. Designed to eliminate static build-ups that are formed in places that are too cold or have too many electronic equipment. Static build-up can damage electronics and produce an electric shock to those who are exposed in areas with high friction. This product is recommended for people who are struggling to find the perfect anti-static product. 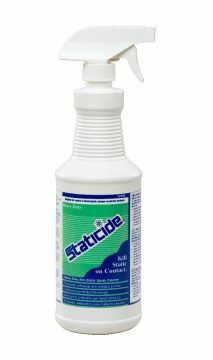 ACL Staticide’s anti-static liquid kills static on every contact and surface. It prevents damage to sensitive components, and electronic equipment by reducing the static charge. This product can be applied on floors, carpets, walls, and other materials. Due to its highly effective static control, it is used by many facilities like electronic production companies, medical laboratories, and textile firms. If you need an anti-static product that keeps electronics safe from sparks, this anti-static liquid is what you’re looking for. Safe to use as it is non-toxic and non-flammable. Reduces PC board solder faults. Eliminates EDP field service problems. Is your electronic equipment malfunctioning due to static build up in the office? This static-eliminating product eliminates static on contact to prevent static build-up in various facilities. ACL’s anti-static products have been used by many electronic companies to protect electronic equipment from static. ACL’s anti-static liquid is definitely worth the investment, as it prevents medical and electronic equipment, textiles, and other items from any static damage. Tired of unwanted lint sticking to your clothing? 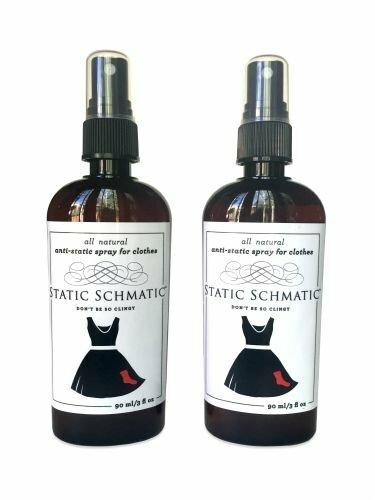 Static Schmatic’s anti-static spray keeps your clothes lint-free! This all-natural anti-static spray is safe and safe to use even on delicate fabrics. It contains Aloe Vera, plant-based soap, glycerin, and salt. It is free of harmful chemicals, strong scents, and sticky residue. This anti-static spray is only 3 ounces, which makes it convenient to bring with you wherever you go. Do away with chemical-filled dryer sheets, use Static Schmatic’s spray on your dried laundry to keep them fresh and lint-free. Washing your clothes in the washing machine assures you that it gets clean. Yes, it does make your clothes clean but once you get them from the dryer, it creates a clingy bond and sticks to your clothes. If you have pets in your home, they’d probably leave every trace of their fur in your furniture or even on your clothes. You wouldn’t want that do you? Everyone wants their clothes clean and fresh, which is why anti-static sprays like Static Schmatic’s are made to eliminate every single trace of lint, fur, and clinging bonds. You won’t have to worry about getting the lint one by one, you can easily eliminate them as you bring the anti-static spray along with you. Can’t seem to get out of the house without cleaning the lint left off your clothing repeatedly? 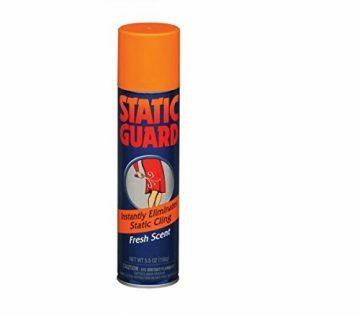 You might want to check out Static Guard Spray, an anti-static wonder that instantly eliminates static cling and can be used to eliminate static around your house, just simply spray on upholstery, carpets, and drapes. This anti-static spray is great for people who constantly wear garments or use fabrics that build up static easily. Not only does it keep lint and pet fur off your clothes, but also keep hair from standing on ends. Never get out of the house with your clothes looking all messy. 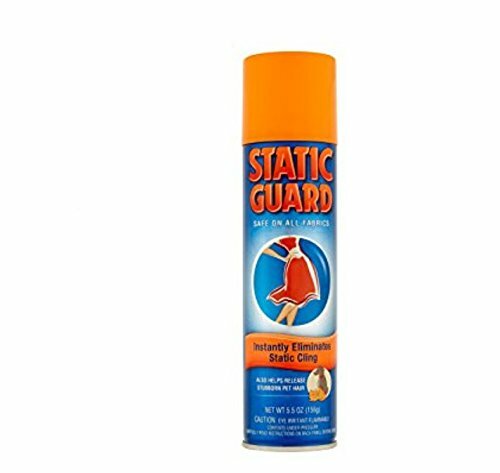 This anti-static fabric spray from Static Guard keeps your clothes looking fresh and new by eliminating static clings. Its lightweight structure makes it convenient to bring everywhere you go, you can even keep one in your car, office, bag, and at home. This not only works on clothes, but also on other fabrics, making it a great investment. Safe to use on all fabrics without the risk of stain. Problems with hair standing at attention, or lint or pet fur stuck on your clothing? The Fabric Spray from Static Guard effectively prevents static buildup. No more worrying about hair and dust clinging to your clothes. A single spray is all you need to keep clothes from sticking together or pet fur clinging to your clothes and other fabric. It has an anti-static formula that frees you from all sorts of static induction that result from various activities. Its lightweight bottle allows you to conveniently bring one or two sprays wherever you go. Be sure not to spray and pull garments apart, as this may cause a spark of electricity. Don’t use directly on hair. You’re almost ready to get out of the house when suddenly your pet starts rubbing their body against your clothes. Their fur is sure to leave visible evidence on your clothes and there’s no way to stop this from happening without an anti-static spray. Fabric Spray from Static Guard allows you to eliminate the static cling you get from pet fur and other objects. This spray is safe to use and there’s no need to worry about getting your clothing stained from the chemicals, as it is safe to use for all types of fabrics. It contains 5.5 oz of anti-static chemicals that will keep your clothes looking fresh over a long period of time. With the right anti-static spray, life can be more convenient and you can go about your day without worrying too much about your clothes.